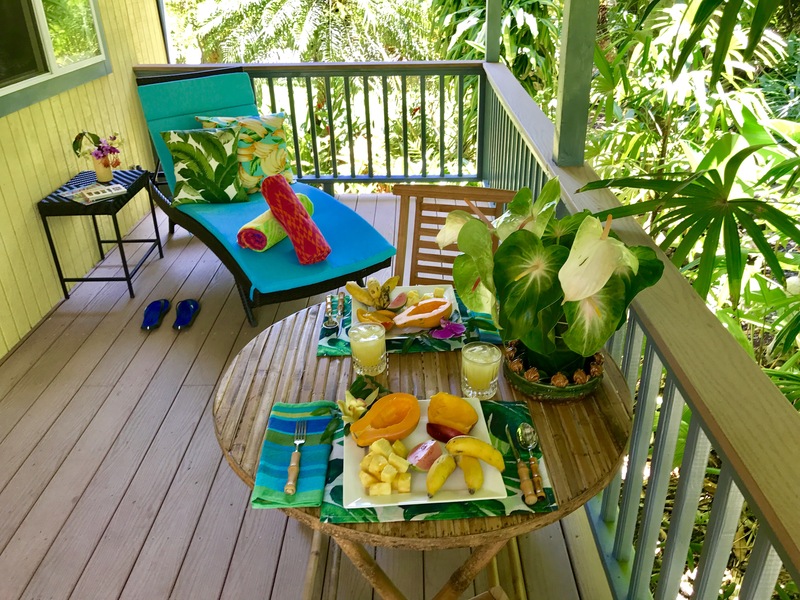 We would like to welcome you to our private Hawaiian paradise. 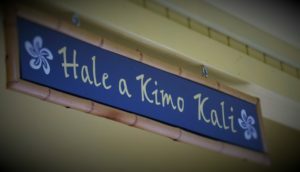 At our home you will feel the abundant Aloha at Hale a Kimo Kali from the minute you walk in. You will be surrounded by privacy, serenity and beauty, all good for the soul and the perfect place to spend your next holiday. You will be renting the entire house and it is ideally suited for individuals or two couples who are vacationing together. The home is nestled into an amazing tropical property landscaped with exotic and colorful plants and palms all surrounded by Hawaiian jungle and private. 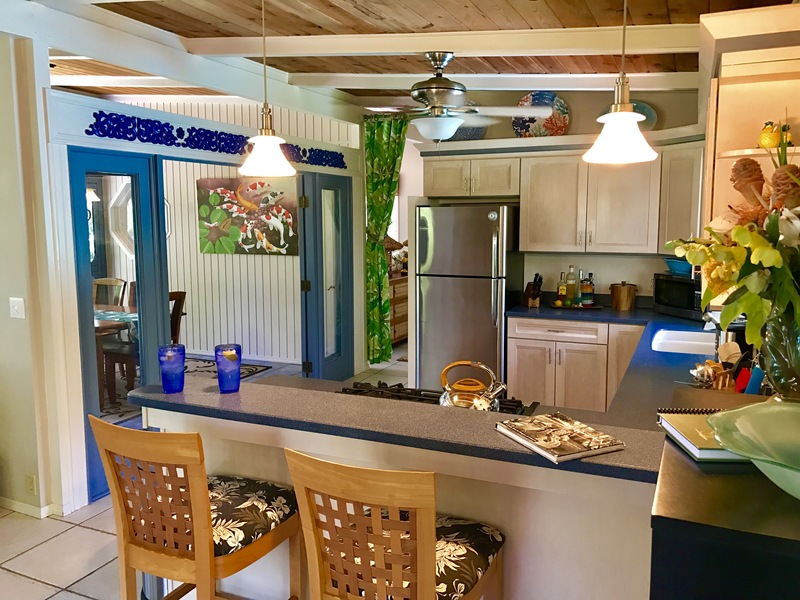 This two bedroom two bathroom home was built in true Hawaiian style to take advantage of the trade winds East Hawaii is famous for. There are four lanais, three that are covered and one open to the sun. 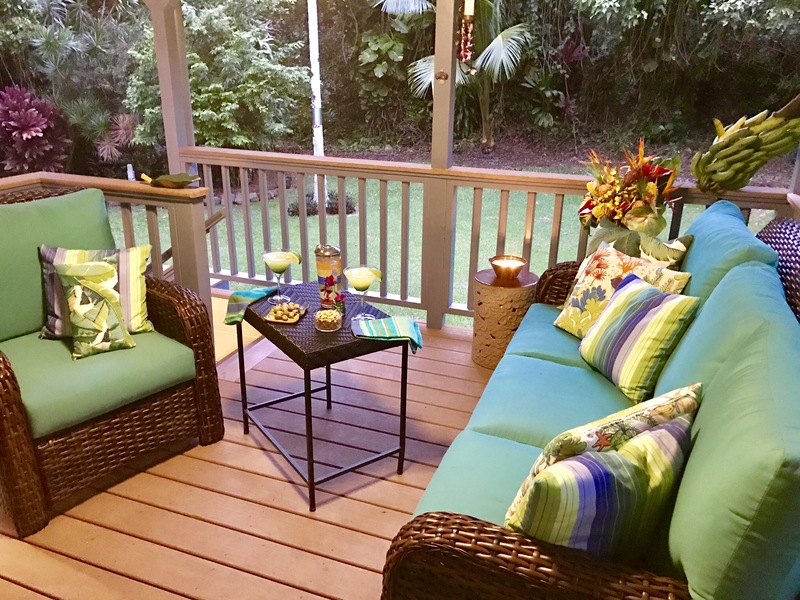 At the back of the house we have comfortable seating, and the lanai’s provide beautiful views of the gardens. There is a gas BBQ for grilling. 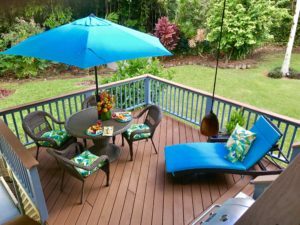 Enjoy dining outdoors, in this beautiful setting. It’s the perfect getaway, if you want to grab a book and read or enjoy your morning coffee or evening cocktails. An expansive lush grass yard is great for outdoor play and private sunbathing. 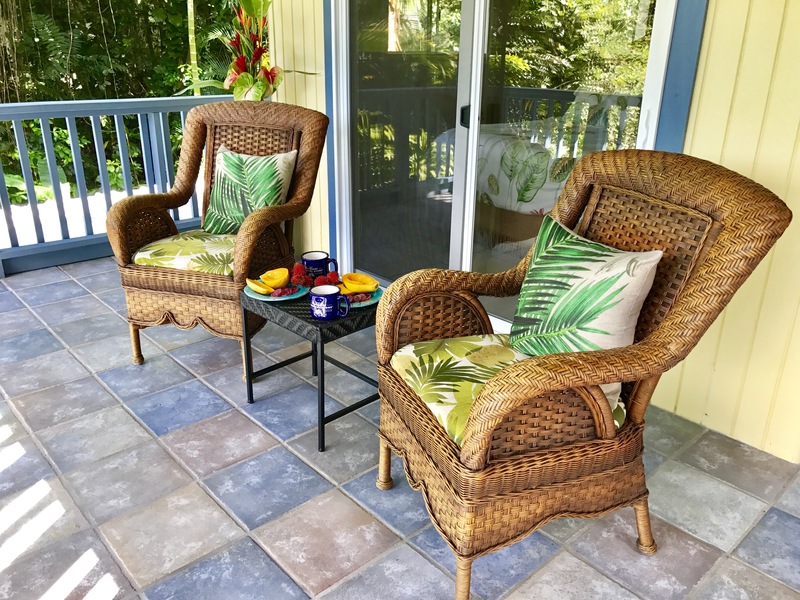 The yard is a tropical park with many palms and exotic plants. There is an outdoor shower with hot and cold water. 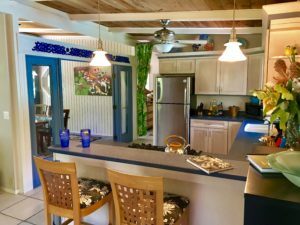 The home offers high ceilings, ceiling fans and a flat screen TV in the living room and in the downstairs suite. It is equipped with WIFI & Dish TV and a DVD player. Our house is a non-smoking household. 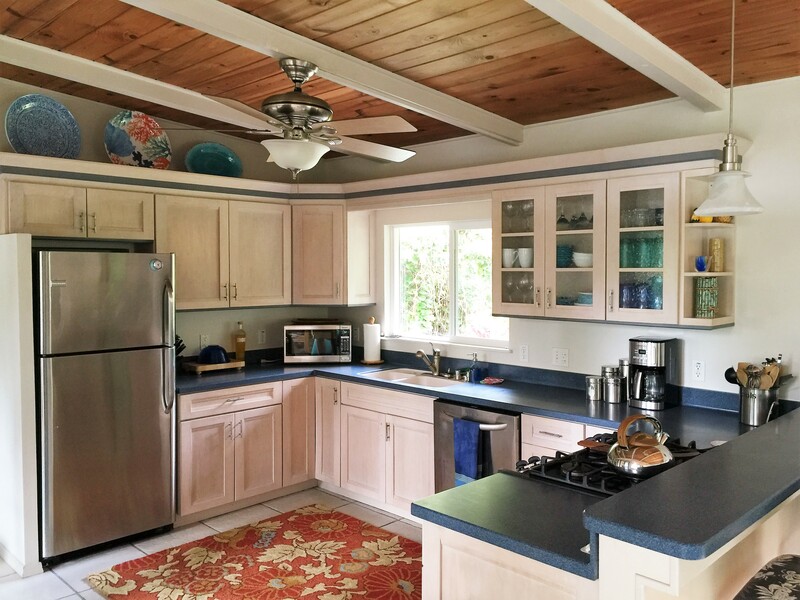 Cooks will love the kitchen, it is stocked with all the necessary amenities including a dishwasher and gas stove. 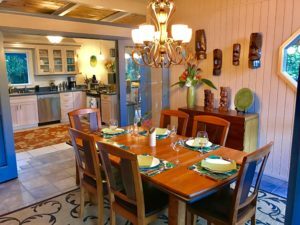 The dining area is easily accessed from the kitchen and living area through French doors and has comfortable seating for six. 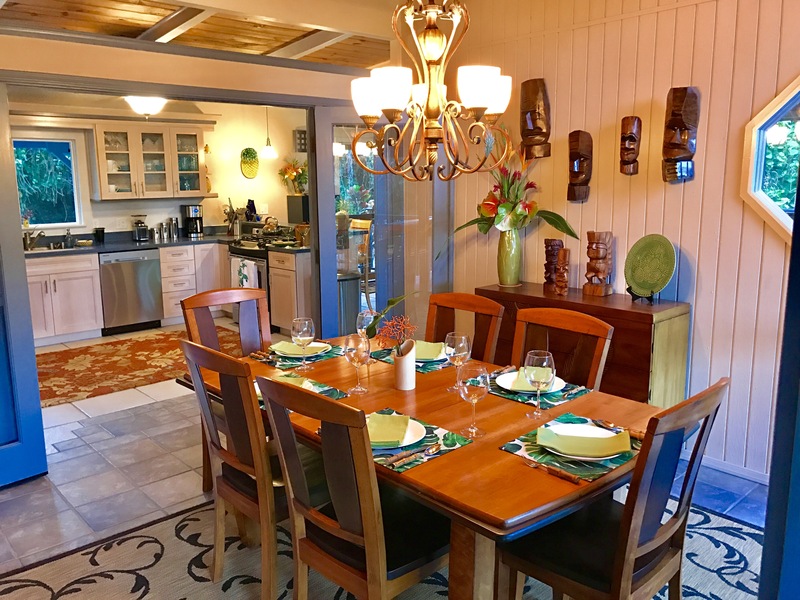 From the dining area you have views to the gardens and access to the east facing lanai. The main floor bedroom has a king size bed. 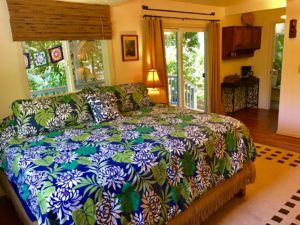 There is also access to the east facing lanai from this bedroom. The upstairs bathroom has a walk-in shower. 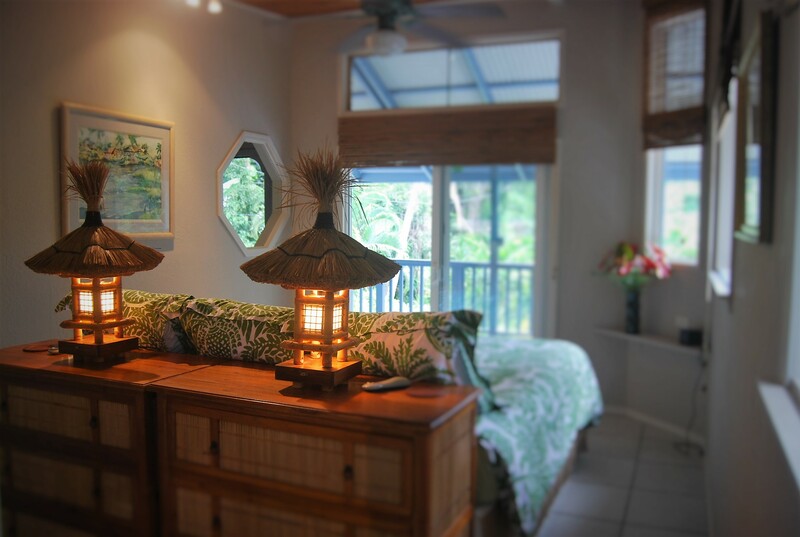 The second bedroom suite is accessed from outside down a few stairs to its own private entrance. There is no interior staircase. 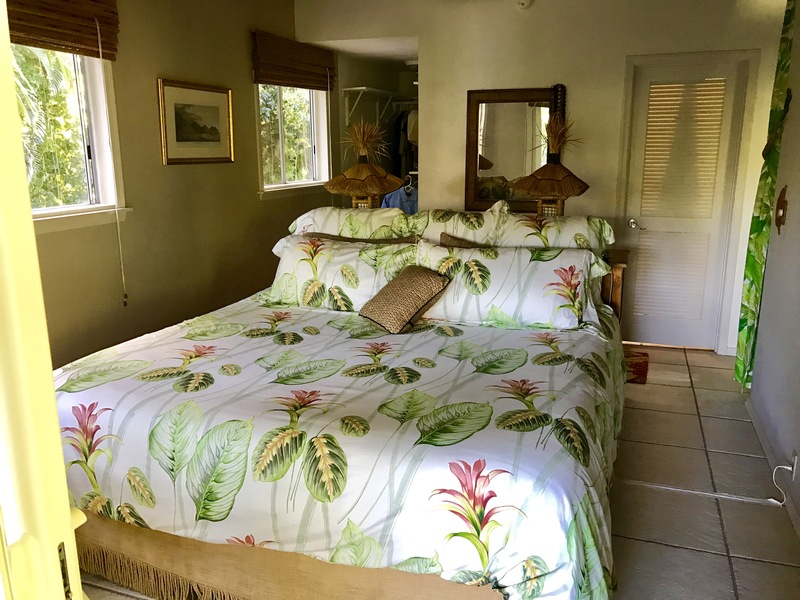 This bedroom has a king size bed, its own private lanai and bathroom with a tub/shower and access to the laundry room. A few blocks out the front door is the Red Road, one of the most scenic and renowned drives in all of Hawaii, featuring black sand beaches, dense rainforest, and lava fields. 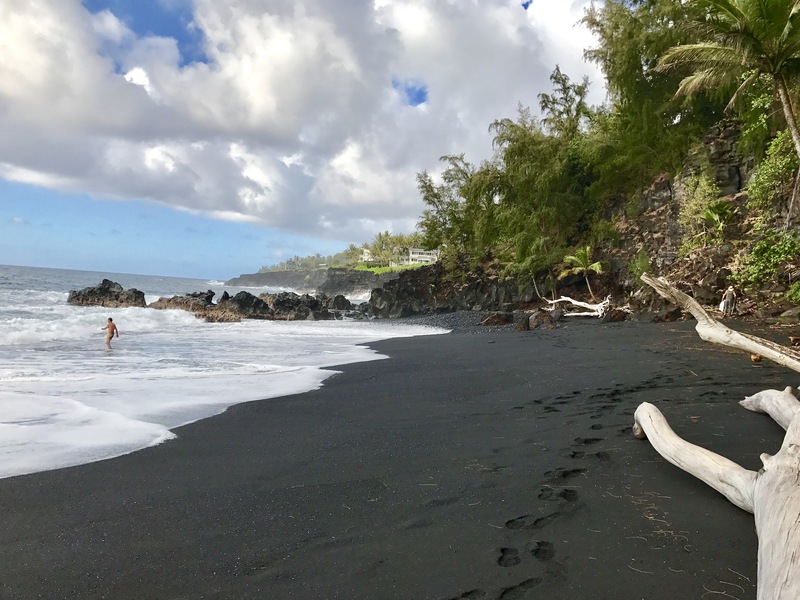 Along this 12 mile drive are a number of beach parks including Pohoiki’s “newest” black sand beach located at Isaac Hale Beach Park. A short 5 minute walk from Hale a Kimo Kali is Kehena Beach, a secluded (clothing optional) black sand beach hidden from view from the roadway. 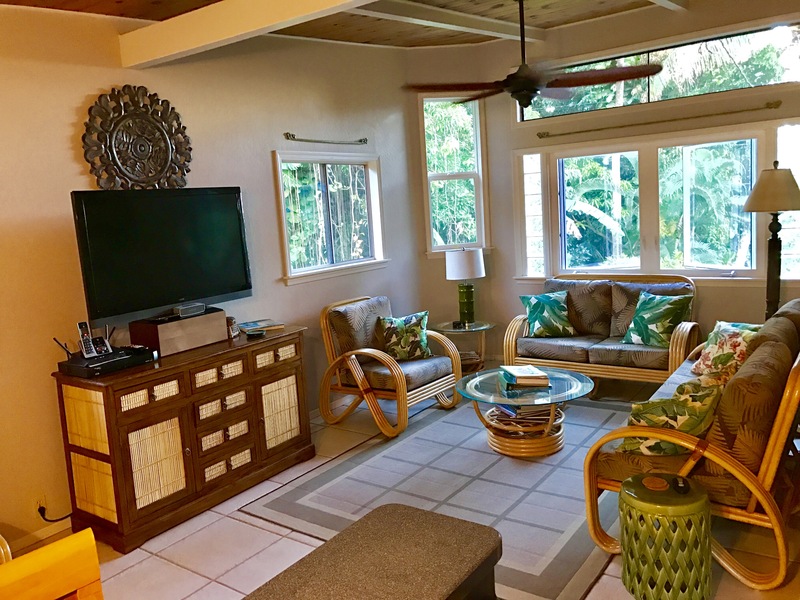 Enjoy yoga and many other classes offered at nearby Kalani Resort (currently closed due to the recent eruption). Two miles away is Uncle Roberts, a night market popular with locals and tourists, which hosts live music, food stalls, handcraft exhibitions, and a bazaar-style market every Wednesday night. 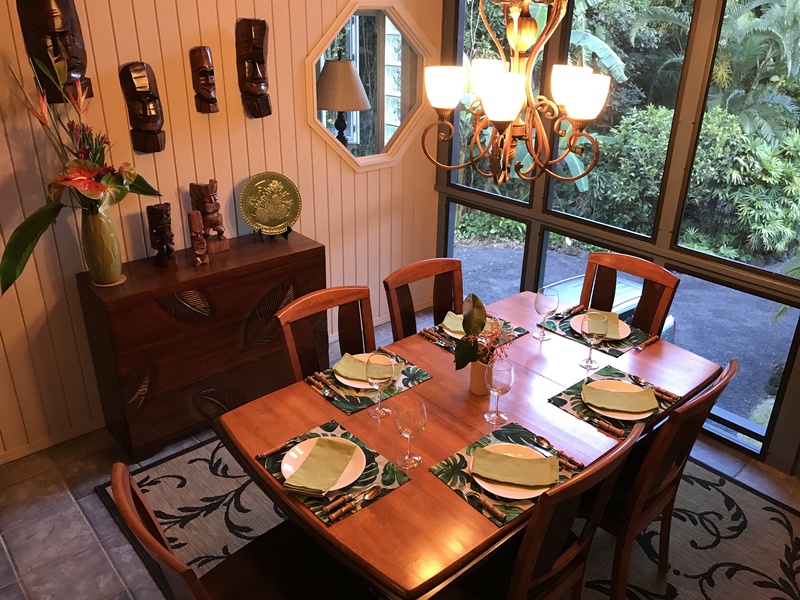 Nearby is the town of Pahoa, a short 17 minute drive. 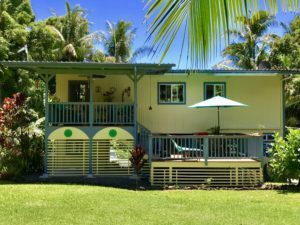 Pahoa is an old mill town with a row of clapboard shops along a boardwalk. Here you will find a variety of local restaurants, a grocery store, bakery, drug store and more. During the weekend, the Pahoa Makuu Farmers Market features fresh fruit, local coffee beans, roasted macadamia nuts, food stalls and local art. 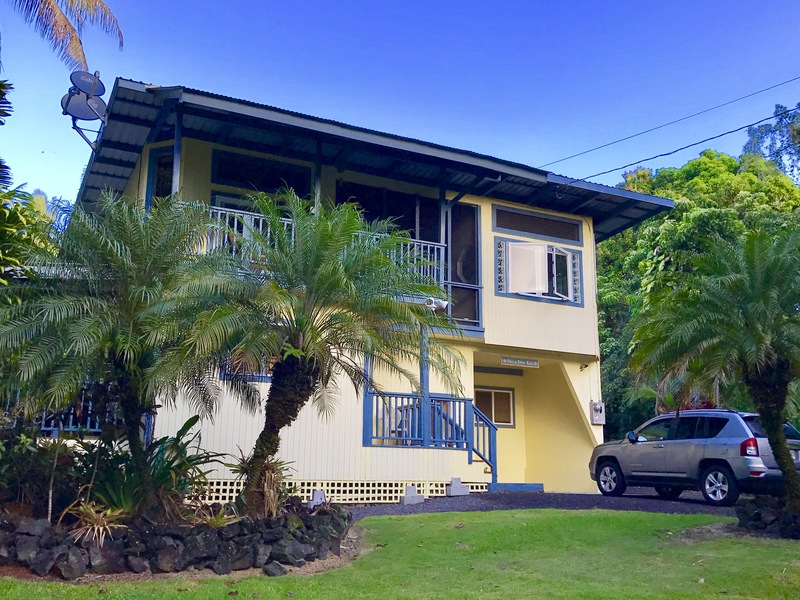 A short drive is Hawaii Volcanoes National Park and Volcano Village, a charming rainforest town known for its glass blowing, art galleries and several restaurants. 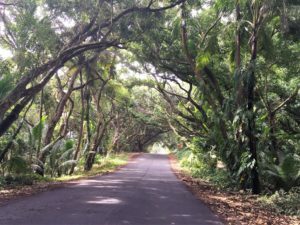 On Puna’s Eastern point is the Cape Kumukahi area with scenic hiking. The air here is measured to be the freshest in the world. 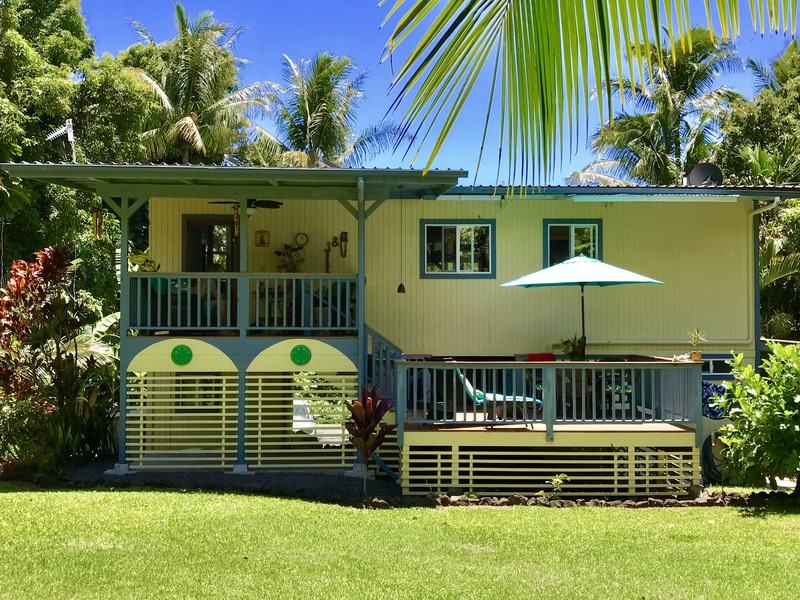 From Cape Kumukahi, hike a little over a mile along the 1960’s lava flows and the recent Kilauea lava flow to the new black sand beach that was created when Kapoho Bay was consumed by the recent volcanic eruption. 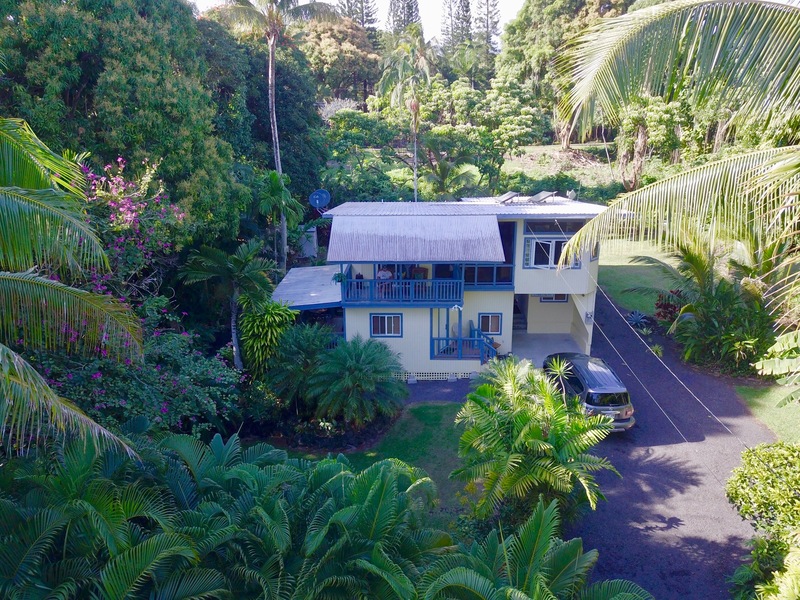 Hilo and Hilo International Airport are located 35 minutes away. 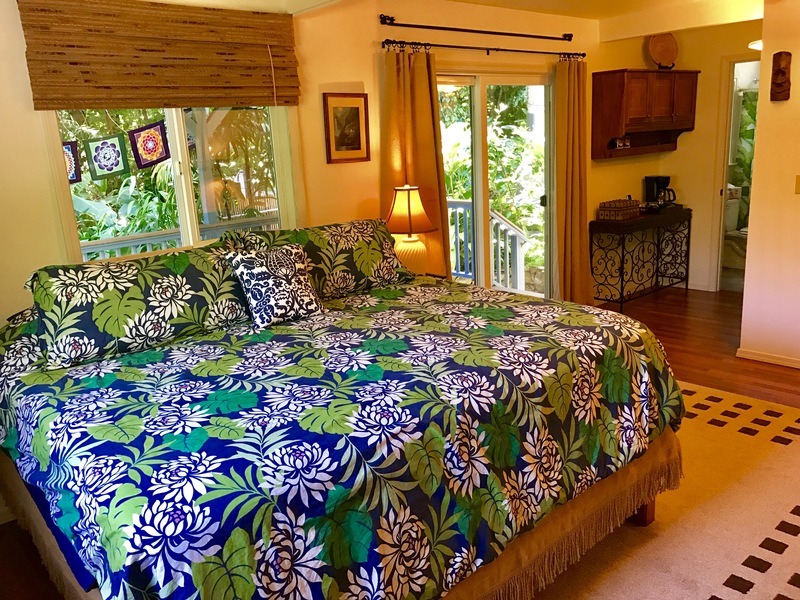 Hale a Kimo Kali with it’s authentic Hawaiian beauty is the perfect choice for your next Big Island vacation to live Aloha.